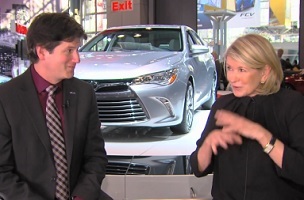 Our headline relays one of several fascinating tidbits contained in cars.com executive editor Joe Wiesenfelder’s just-posted New York International Auto Show chat with Martha Stewart. We’re not going to spoil the other tidbits. But to tease a bit more, when you watch the video above, you will learn more than you likely thought possible about Martha Stewart and pick-up trucks, Martha Stewart and high-lows and Martha Stewart and 95 hph tractors.